One of the country's major movie events, the 9th Beijing International Film Festival, will open with a Sino-Kazakh production about late composer Xian Xinghai, Xu Fan reports. The Composer, the first Sino-Kazakh production depicting the final years of Chinese musician Xian Xinghai, is set to open the 9th Beijing International Film Festival on Saturday. As one of the most recognized movie events in China, the festival-which will be held through April 20-recently announced 15 nominated films, including The Composer, which will contend for the festival's top honor, the Tiantan Award. Inspired by a speech made by President Xi Jinping during his visit to Kazakhstan in 2013, the film looks back at the life of Xian, a musician who was once a household name and best known for his epic work, Yellow River Cantata. When the Great Patriotic War (the Soviet Union's defensive war against the invasion of Nazi Germany) broke out in 1941, Xian-who was assigned by the Communist Party of China to work in Moscow-found himself stranded in Almaty, the largest city in Kazakhstan. With the help of Kazakh musician Bakhytzhan Baikadamov and his family, Xian spent his final years living out the war in Kazakhstan, where he concentrated on writing music. In early 1945, the musician who was suffering from multiple diseases was sent back to Moscow, where he died in a local hospital on Oct 30 the same year. "From the film, the audience will get a sense of the indomitable spirit of the Chinese people and their attachment to the homeland. The audience will also feel the profound historical friendship between the Chinese and Kazakh people," says Wang Zhi, deputy secretary-general of the festival's organizing committee. 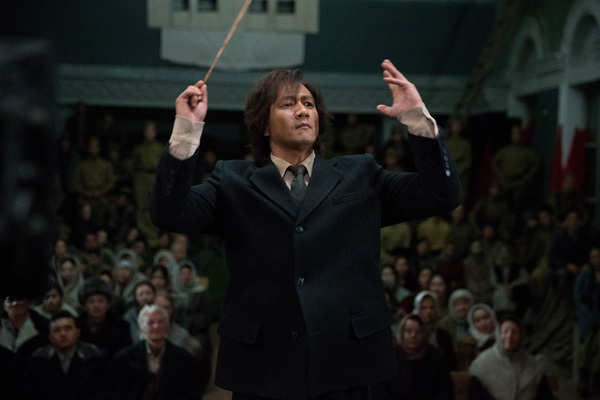 Jonathan Shen, the producer of The Composer, reveals that the crew spent five months shooting scenes in China, Russia and Kazakhstan, and how the team used many special effects to re-create the wartime sequences. Saturday, the festival's opening day, marks the 80th anniversary of the debut performance of Yellow River Cantata in Yan'an, the headquarters of the Red Army after the Long March which lasted from 1934 to 1936.